Sorry for the late post today. Family in town + a sick baby = a momma who's falling behind! (I like to think I'll do better tomorrow, but no promises. :) So this evening we're just going to take a quick look at one of my favorite ways to spruce up a space. Throw pillows! I love the way throw pillows can really make a room come together and feel complete. I also love that with a quick switch-a-roo to new pillows the whole room can feel fresh and new. And even more, I love it when pillows can coordinate with seasonal decor and colors. But I know that none of us really want to spend money buying new pillows all the time, or storing them while they are out of rotation. And the good news is, we don't have to! So today we are going to look at making simple pillow cases for our throw pillows, so we can keep using the same old pillows but give them a new look whenever we want (and save tons of $$$ and space in the process! ...into spiffy new pillows that actually match your decor! It is probably the easiest thing I know how to sew, and a great place to start if you are a beginner! Really, the possibilities are endless. So go find those pillows around you home and unlock their potential! It's amazing what a difference it will make! Maybe try something with yellows and reds for fall? Or maybe with a leaf applique? 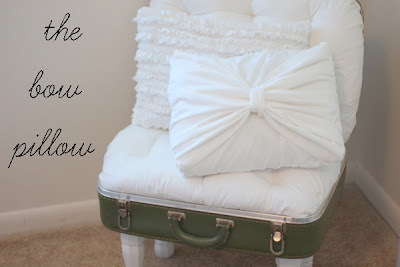 What ideas do you have for dressing up throw pillows? Enjoy time with your family and I hope baby B gets to feeling better soon! You have a sewing list! I'm so proud! :) I crocheted some hats for Baby B, so you can be proud too. :) And thanks for the well wishes for Baby B! He is on the mend, and I'm hoping he'll be back to normal soon.